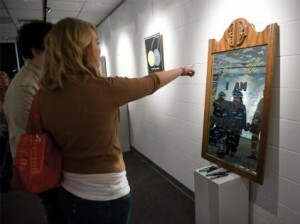 California Baptist University opened a new art gallery in Lancer Plaza, formerly known as Adam’s Plaza, on March 28. This new gallery will serve as a place for Graphic Design and Digital Media majors and Visual Art majors to exhibit their senior shows. Rachel Weinstein, senior, was the first to display her works in the new gallery. Her show entitled “I Can’t Fill the Gallery” was a series of digital art pieces. Several pieces within the collection were interactive and allowed visitors to the gallery to add to the pieces. Many students, professors, and local community members attended the opening.